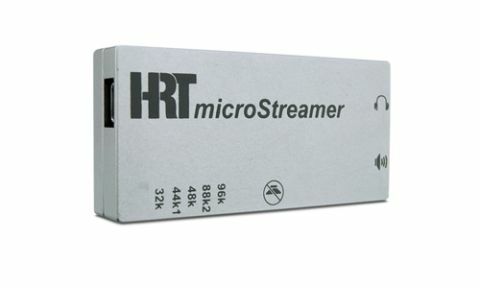 HRT microStreamer review | What Hi-Fi? It's taken a remarkably short time for High Resolution Technologies to build an enviable reputation for producing great-value USB digital-to-analogue converters. The new microStreamer simply adds to that impression. This tiny, aluminium-cased unit measures just 1x3x6cm, and connects to a laptop by means of a short (supplied) USB-to-mini-USB cable that carries both the audio signal and power. While a built-in USB connector (found on the likes of Audioquest's DragonFly) looks neater, HRT feels such a design has more chance of being broken if a laptop is moved. The microStreamer has two outputs – one variable for headphones and the other at line-level for connection to an amplifier. The USB input is of the increasingly common asynchronous variety, which means that the DAC is in charge of the timing of information flow, not the computer – generally a good thing as far as sound quality is concerned. How does the microStreamer sound? Very good indeed. It has a clear and detailed delivery with the kind of natural feel and fluidity that few budget DACs approach. Its tonality is well judged too, and there's refinement aplenty: it refuses to sound overly harsh or aggressive, even when provoked by below-par recordings. But while the microStreamer is good enough to make low-bitrate recordings sound acceptable, it really shines when fed higher-quality source material. A 24-bit/96kHz recording of Kate Bush's 50 Words for Snow – 96kHz is the microStreamer's upper limit -– shows just how capable this little unit is. It delivers the texture and warmth in her voice beautifully, while keeping the dense musical backdrop in check. It doesn't matter what type of music you listen to: the microStreamer's insight, cohesion and surefooted rhythmic ability will ensure it works well. We think Audioquest's all-conquering DragonFly finally has a rival to worry about.